La Palina premium handmade cigars represent a marriage of the finest tobacco leaves blended by master artisans. The blends are smooth and well-rounded, cigars of elegance and finesse. The draw is easy, the burn is even, and the construction is flawless: an unforgettable experience. The Connecticut Valley is famous for their shade-grown wrapper leaves. The mild strength of the smooth leaves have hints of wood and toast and are esteemed in the industry for their consistency. The wrappers are pleasing to the eye and mild enough to let blenders highlight the fillers. La Palina utilizes Connecticut seeds that are grown in Nicaragua, manufactured at the AJ Fernandez Cigar Factory in Estelí. Due to Nicaragua’s variety of growing climates, and rich soils, the country produces an array of distinct full flavor profiles in their tobaccos. LP Nicaragua Connecticut Gordo is an affordable series now available to purchase online or at your favorite B&M. La Palina Nicaragua Connecticut Gordo, the first of their cigars produced in Nicaragua, contains an Ecuadorian Connecticut Shade leaf binder and filler tobaccos which are cultivated in Nicaragua. The mellow to medium-bodied cigar has notes of roasted nuts, earth, cedar and hints of sweet honey. 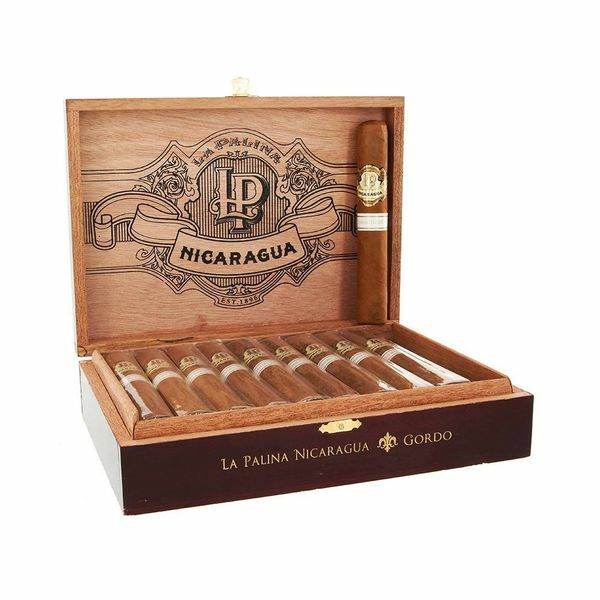 La Palina Nicaragua Connecticut amps up the company’s already stellar portfolio of fine cigars. Historically, people have enjoyed the pleasures of a fine cigar as they sipped brandy or whisky in the evening. I found the La Palina Nicaragua Connecticut paired nicely with the delicious rum, Flor De Cana 12 Year. Founded by Francisco Alfredo Pellas at the San Antonio Sugar Mill, in Chichigalpa, Nicaragua in 1890, the rum is aged for 12 years in American white oak barrels that once held whiskey and bourbon. Notes of rum soaked raisins, macadamia, hazel and Brazil nuts are sharp but smooth on the palate. The pairing of Flor De Cana 12 Year and an LP Nicaragua Connecticut is a certified winner!